Reproduced with permission of the Darlene Dorgan Bjorkman Estate. 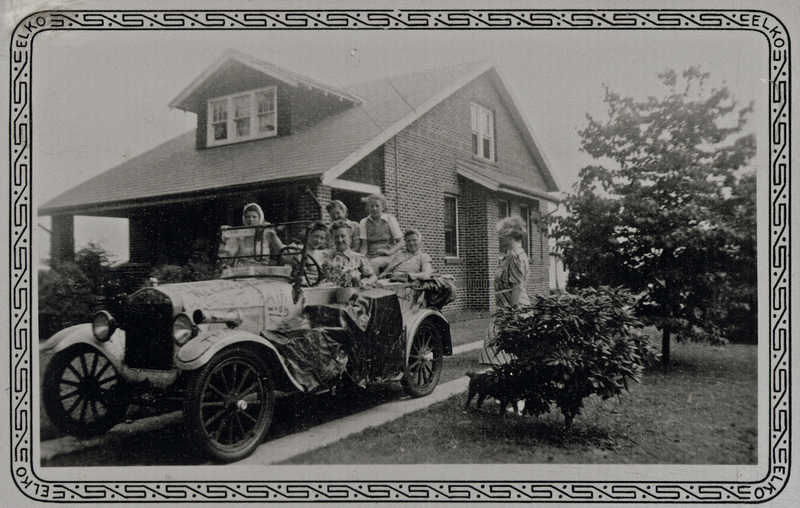 In Part I, we were introduced to Darlene Dorgan and her 1926 Ford Model T Touring Car, in which she and four other girls had traveled during the summer of 1934 to Devil’s Lake, WI on an auto camping trip, then diverted through Madison, WI and Chicago, IL before returning home, full of happy memories of their travels. 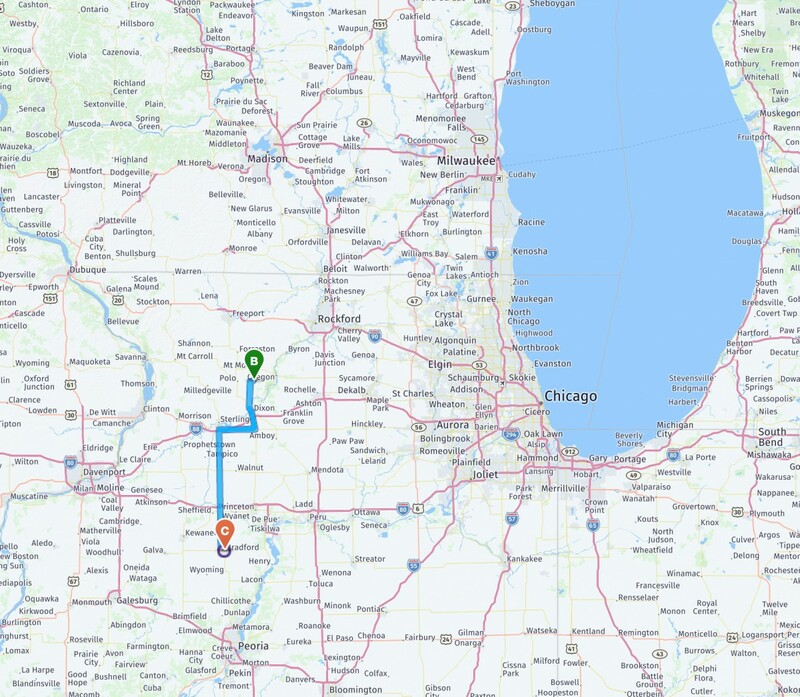 From the sketchy details available, it seems that Darlene and a few friends only ventured as far as White Pines Forest State Park in Illinois during the summer of 1935, a distance of about 90 miles one-way. 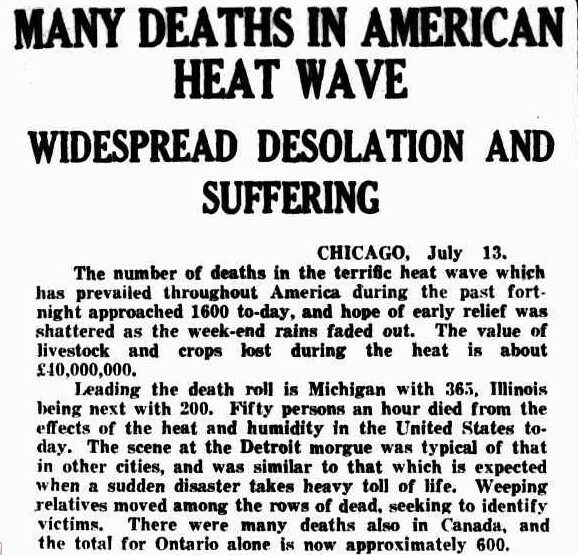 One of the worst heat waves on record would hit the Midwest in the summer of 1936. Darlene may already have been planning another camping trip to Devil’s Lake, but the heat and her sense of adventure led her to change up the route a little. Reproduced with permission of the Ruth Gustafson Johnson family. Devils Lake, WI was again the destination, but the girls would take a more circuitous route to get there. 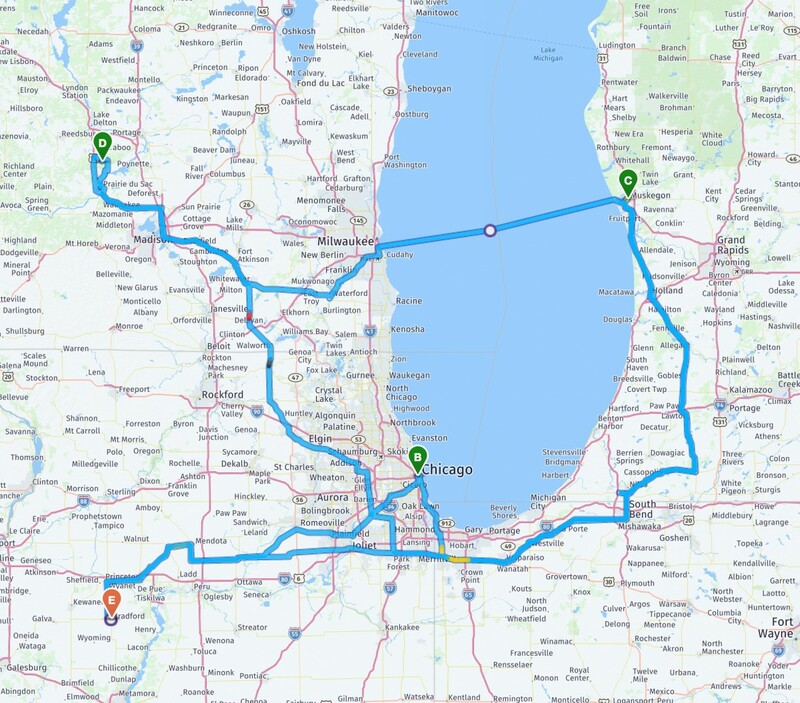 Heading Northeast from Bradford, they would stop for several nights on the Eastern shores of Lake Michigan, enjoying the opportunity to swim and enjoy the cool breeze off the lake. After a night in Muskegon, they caught the ferry across to Milwaukee. If you study this photo closely, you’ll notice there are six girls seated with the ferry Captain. The Model T only seated five, but the girls went for it anyway! Something had to give, however, and in fact, they had to stop at one of the girl’s homes on the way out of Bradford to offload some of their luggage, and again at a friend’s near Buda, IL, as they couldn’t climb the shallow hills in that area. Note that this difficulty was due to being overloaded, not due to the Model T’s fuel tank location, which many of you will remember required owners to have to go up hills backwards due to the gravity-fed tank being located under the seat. In fact, the tank had been moved to the cowl for 1926 from its previous location, alleviating the fuel starvation issue. 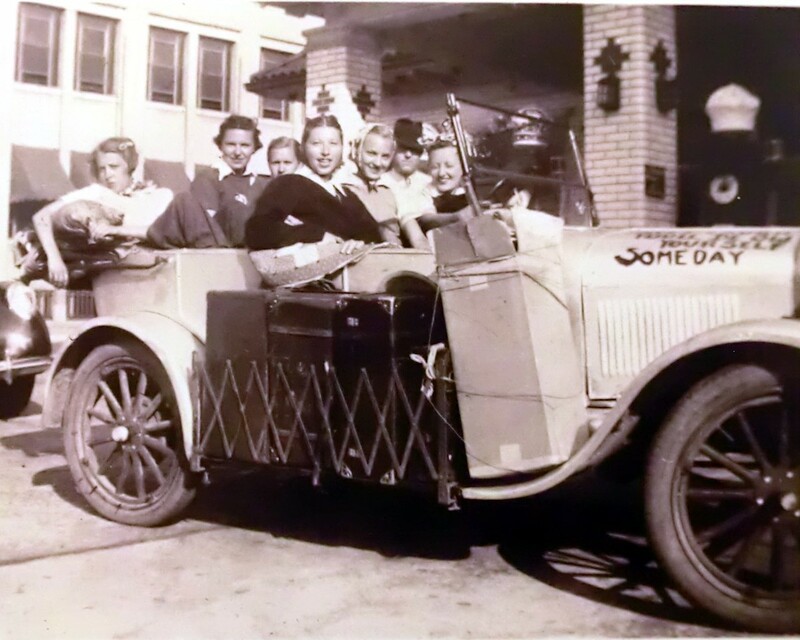 An additional challenge the girls faced was that Darlene’s T was equipped with the thinner three-tube-core radiator Ford introduced in 1926, as a replacement for the previous five-tube design (there was no water pump, the system worked on the principle that warm water rises). While Ford’s engineers insisted the new offset-tube design was just as efficient at cooling, customers in the real world disagreed. “Miles per gallon” quickly came to refer to water instead of gasoline, and the new design, lacking a crossbar support, also tended to pull itself apart on bad roads. 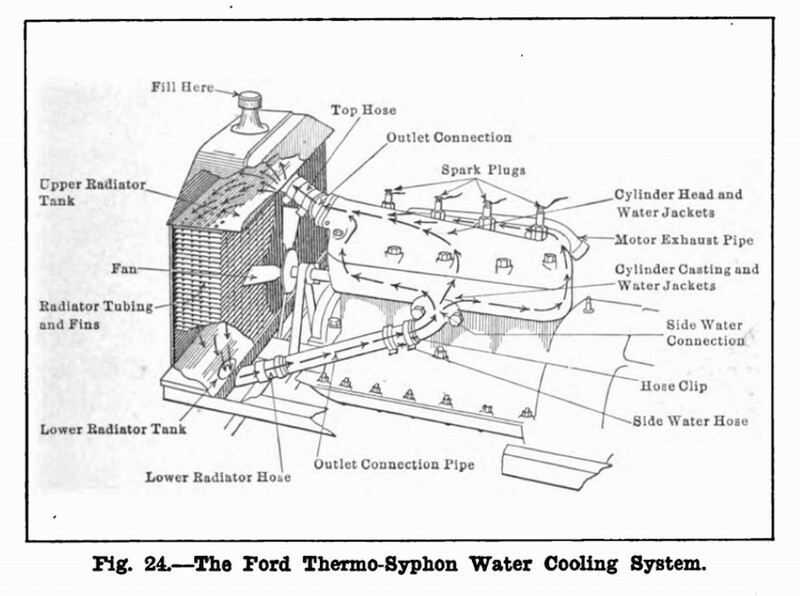 Ford would first use a thick spacer to locate the fan closer to the radiator, and eventually would offer a thicker four-tube unit for cars sold in warmer climates. While spending some time at Devils Lake, WI, the girls would hike to see Balanced Rock and Devil’s Doorway in addition to enjoying refreshing swims in the lake. They also met a group of six boys, also fellow campers, and the Tin Lizzie was even called on to push-start the boy’s car once. Darlene at this time added a new rule for her travelers: “No dates!” It was also on this trip that the car began to be referred to as “The Silver Streak,” and once home, the trip was deemed newsworthy enough to make the Peoria paper, even if the trip mileage was a bit exaggerated (the T had no odometer). Full of happy memories, Darlene settled back into her beauty shop work and began planning her next trip. 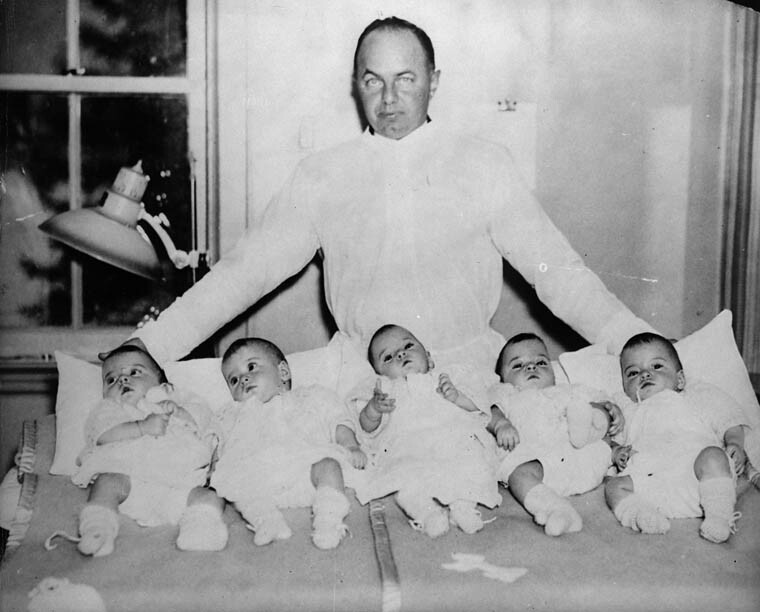 One of the big news sensations going on in 1937 were the Dionne Quintuplets born in Callander, Ontario in 1934. The babies had been taken from their parents a few months after birth and put into a guardianship by the government, “to ensure their survival.” The government recognized the massive public interest in the girls and quickly built a tourism industry around them. Reproduced with permission of the Ruby McDonald Nutter Estate. Darlene set her mind on a trip to visit the Quints, which would be of much longer duration than her previous vacations – over 2,600 miles. 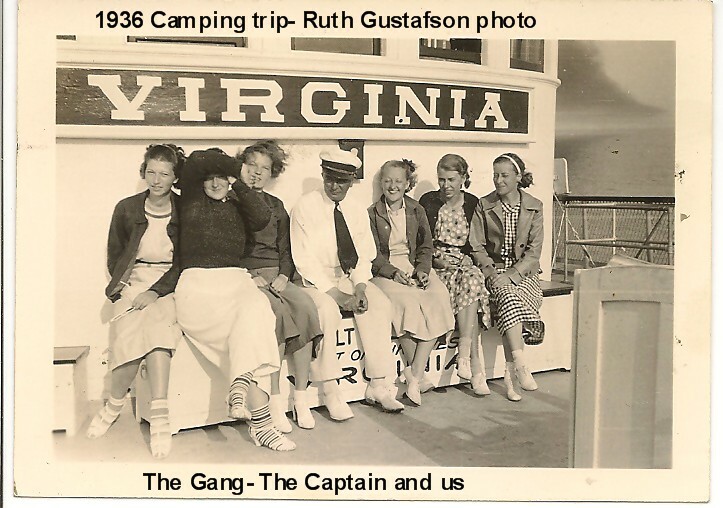 While it was still considered unusual for young women to travel on their own in this manner, social mores were beginning to change with women like Wallis Simpson, Amelia Earhart and Margaret Mitchell all making the headlines. 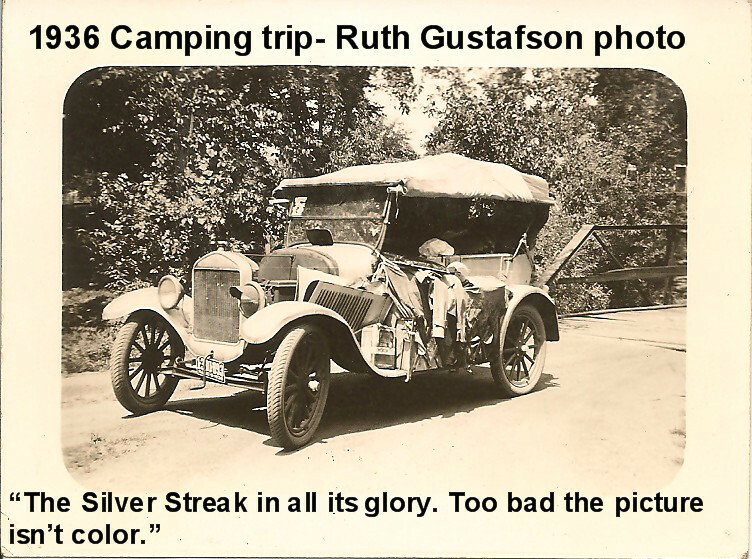 Darlene headed the Silver Streak back home on a different route, and the girls spent the last few days of their trip camping at Devils Lake, WI again. Another article would make the Peoria paper, and Darlene would return to her quiet shop for the Winter. Reproduced with permission of Winnie Swearingen Hays. 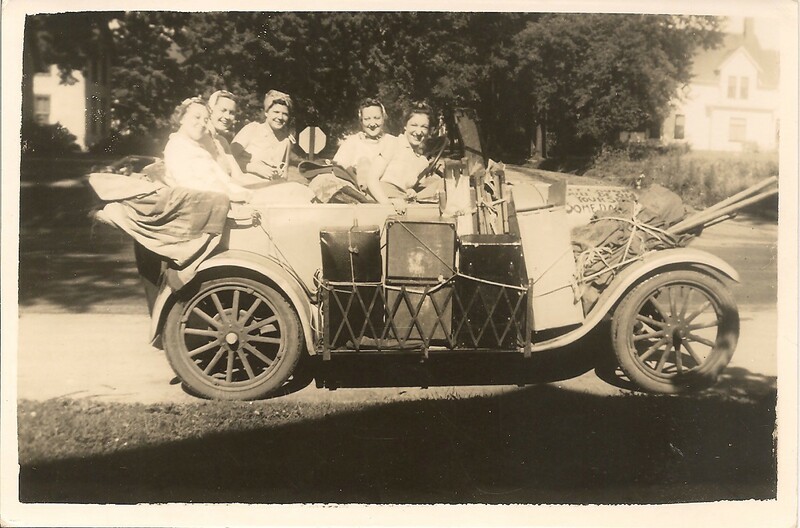 Returning to familiar haunting grounds, Darlene and four of her friends set out in late July, 1938 for Devils Lake, but without having fully decided what other points to visit in the area while on their two-week’s vacation. They had no more than set up camp when a group of boys camping nearby pointed out that Henry Ford had invented their Model T, and was having his 75th birthday in a couple days. 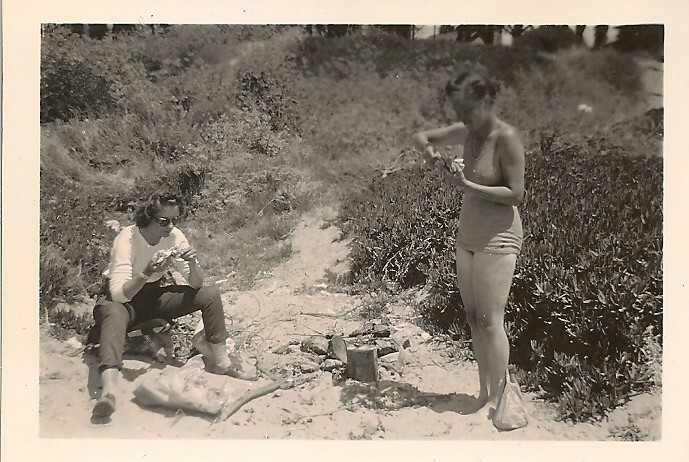 That decided things for Darlene, so the girls packed all their gear the next morning and headed for Dearborn, Michigan. Upon arrival, the girls camped in a park, and the next morning decided they’d simply drive up to the gate and ask to meet Mr. Ford. After driving around a bit, they pulled up to an unattended locked gate. While trying to decide what to do next, Henry Ford’s right-hand-man Ray Dahlinger drove up and asked if they needed help. When told why the girls were there, he said “Follow me,” unlocked the gate, and they drove right in! The girls ended up having lunch with Mr. Ford, who asked where they were staying. Upon hearing they were camping in the park, he insisted they spend the rest of their time in the empty farmhouse by the Cannery in the Village. The next day, the girls had tintypes made of themselves in the old studio – the witty photographer, noting the girl’s sunburned arms, wrote “The Peeling of the Belles” across one folder containing the prints. After returning home, several of the girls wrote follow-up letters to Mr. Ford, and Darlene would begin thinking about the possibility of attending the 1939 New York World’s Fair and the Ford exhibit in particular. The Silver Streak was now thirteen years old, and showed no signs of stopping. World events, on the other hand, were not looking good, but the policy of appeasement still held sway. In America, the effects of The Great Depression were still somewhat in evidence (The Grapes of Wrath was published this year) and Amelia Earhart would officially be declared dead after her disappearance in 1937. Batman would make his first comic book appearance this year, and another societally-changing 20th Century invention would move into the spotlight when RCA televised the opening of the World’s Fair, including a speech by President Franklin Delano Roosevelt, the first president to appear on television. 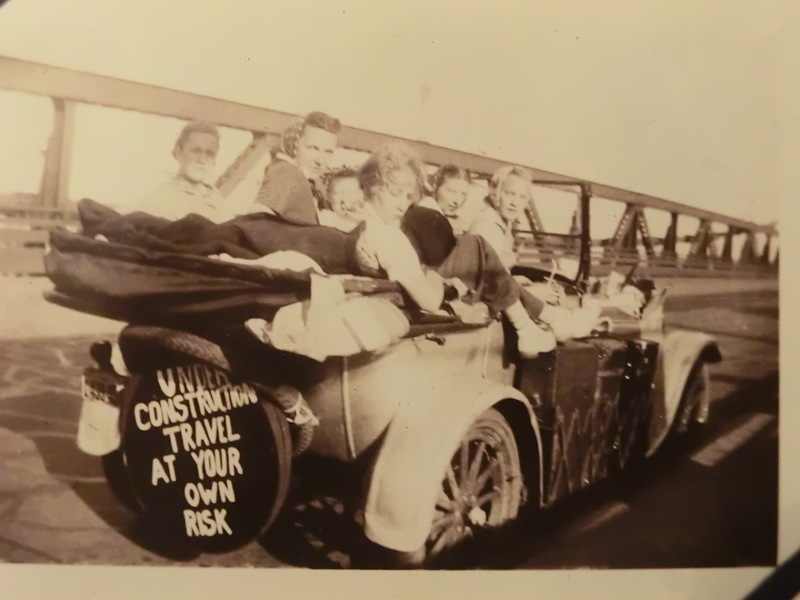 Unlike the 1938 trip, Darlene meticulously planned the six-week-long trip to the 1939 New York World’s Fair. Five girls would join Darlene, who had written in advance to ensure they would arrive at the Fair when Mr. Ford would be present. 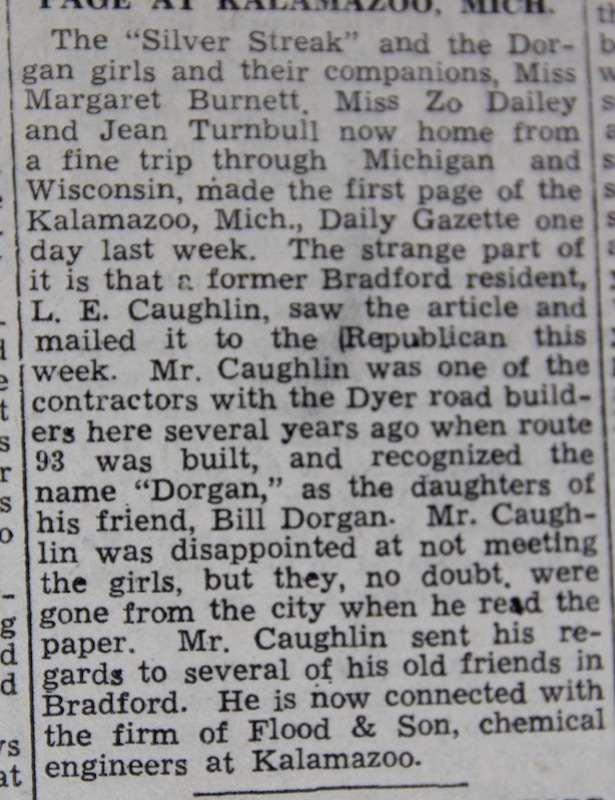 The girls first stopped in Dearborn on the chance of seeing Mr. Ford there, but he was unavailable. 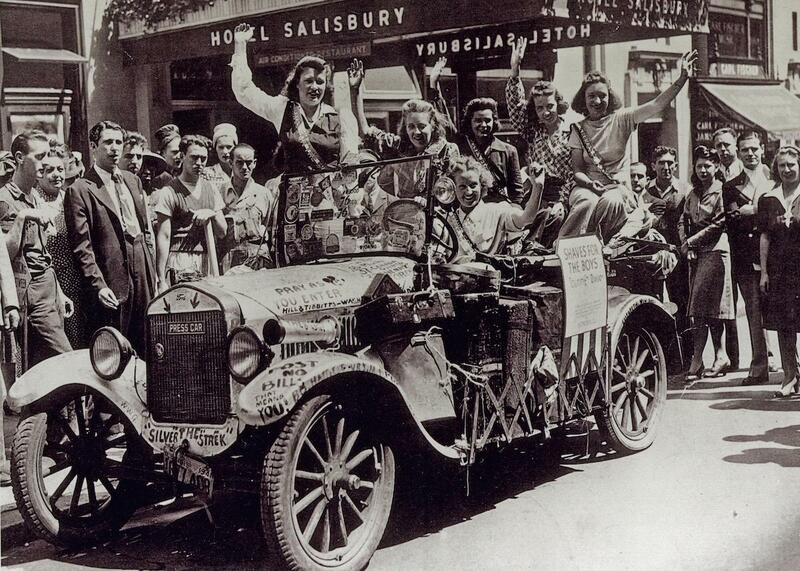 The Silver Streak was recognized, however, and the girls were well cared for by Ford employees before heading on. 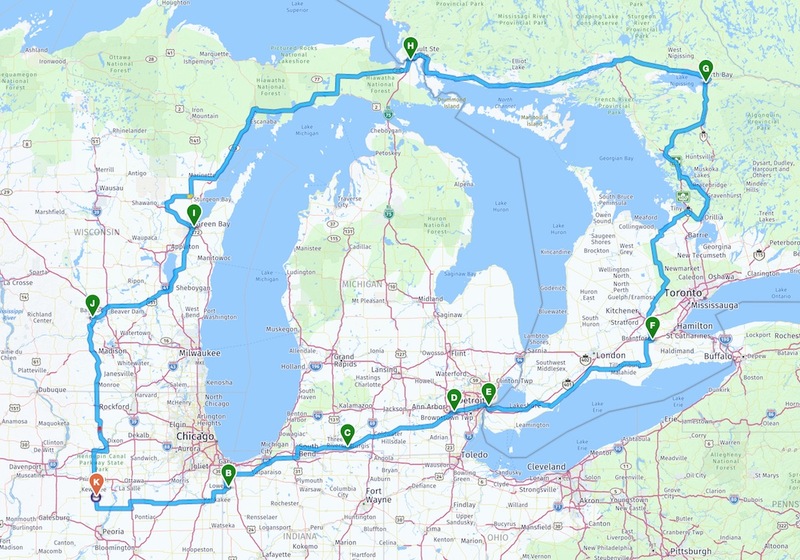 Their route took them into Canada again, where they stopped for gasoline at a station in Brantford, Ontario. 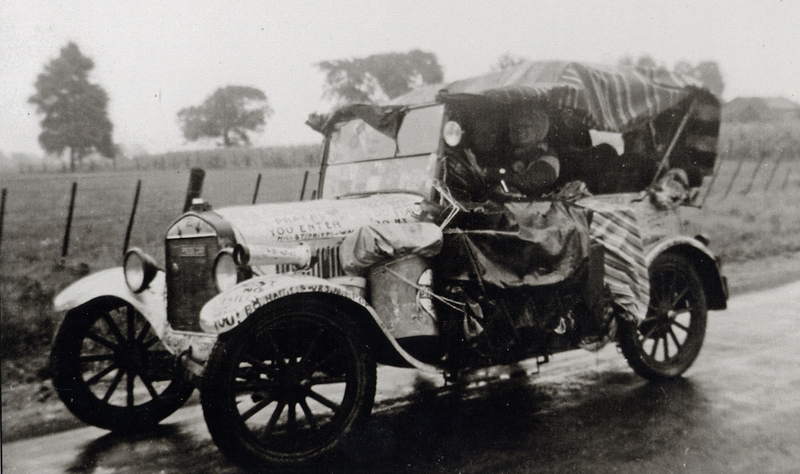 Due to the rainy weather, the girls were traveling with the tattered and patched top up and side curtains hung in place – when they pulled in, the attendant thought they were bandits and called the police! 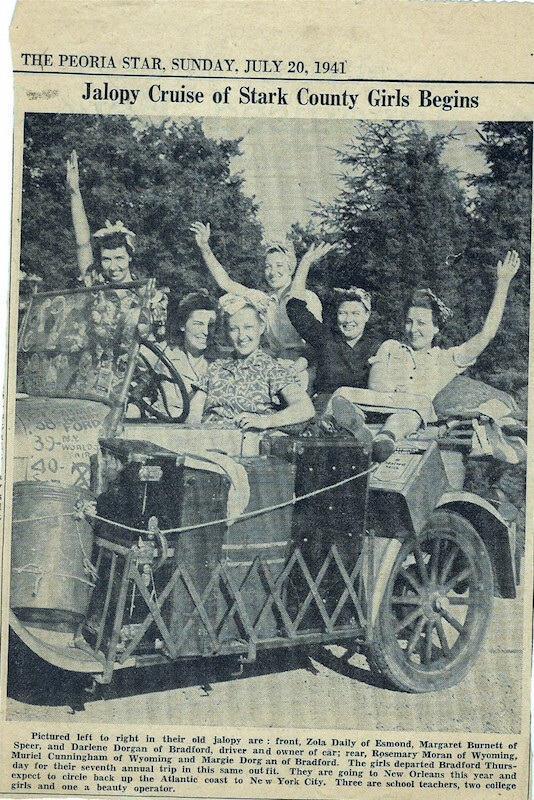 The girls continued on to the Fair, where their expenses were fully covered by the Ford Motor Company. Unfortunately, Henry was again unavailable. The girls then continued on their trip, stopping in Washington D.C. before heading North, then back West toward home. They again stopped in Dearborn on the way and were again unsuccessful in connecting with Mr. Ford. 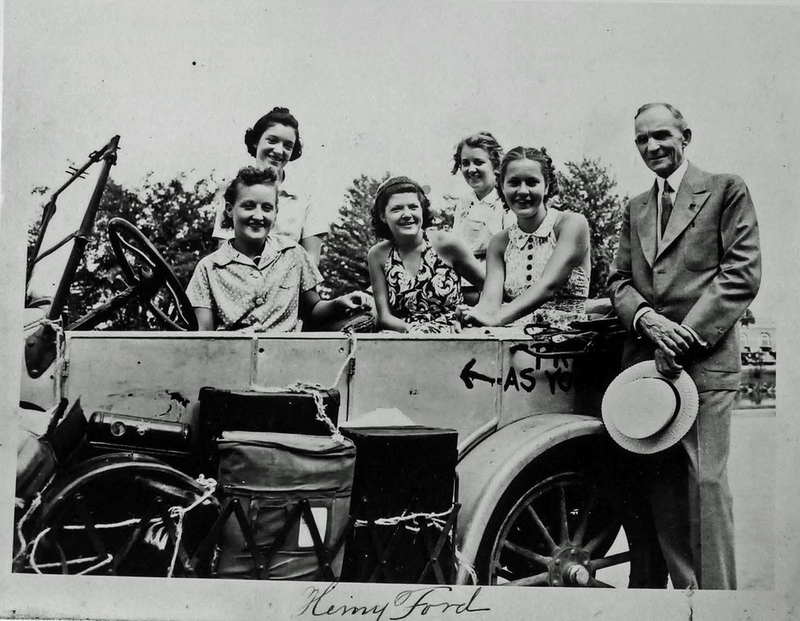 You’ll note that the photograph is signed by Henry – the story is that the photo was taken by a Ford photographer at the Fair. Mr. Ford had seven copies made and signed each one before sending them to Darlene with instructions to give one to each girl and send one copy back to him with all the girl’s signatures. That copy now resides in the Henry Ford Museum Archives. By this time, Darlene was quite confident in her ability (and the Silver Streak’s) to travel long distances and even boldly meet famous people. While they had missed seeing Henry on their 1939 trip, they certainly enjoyed the time spent at the World’s Fair, so it was a natural move for Darlene to consider a trip to the 1940 Golden Gate Exposition in San Francisco. In May of 1940, she would write to Henry Ford and request a letter of introduction to the “Ford Branch in the West.” She would receive a return reply from Frank Campsall in mid-June indicating their Branch Manager in Richmond, CA would be on the lookout for the girls upon their arrival. 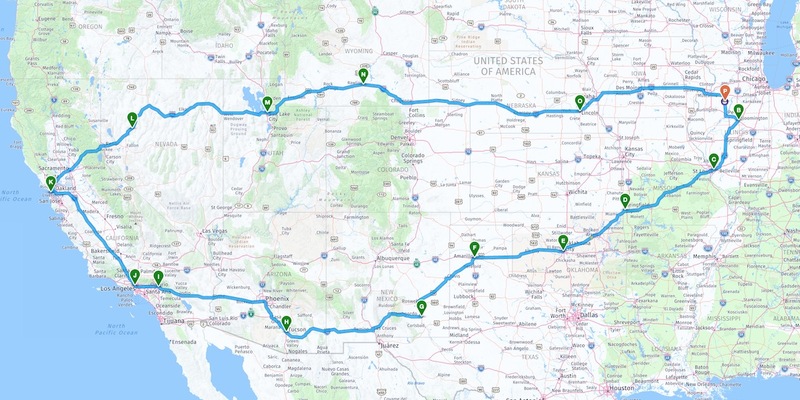 Due to the distance, this would be a much longer trip – six weeks, and over 6,000 miles. Four girls would join Darlene, and they would set out on Sunday, July 7. Prior to leaving for the trip, Darlene repainted the car (silver again), covering up all of the Lizzy Labels from the previous trips. She also set the girls to repairing the top, using an assortment of awning remnants! The girls then repainted many of the Lizzy Labels, loaded their gear, and headed West. Heading down Route 66 through Oklahoma in the heat of the day, the girls finally had to put the top up, choosing the lesser of two evils – shade and stifling air with the top up vs. direct sun and stifling heat with it down. 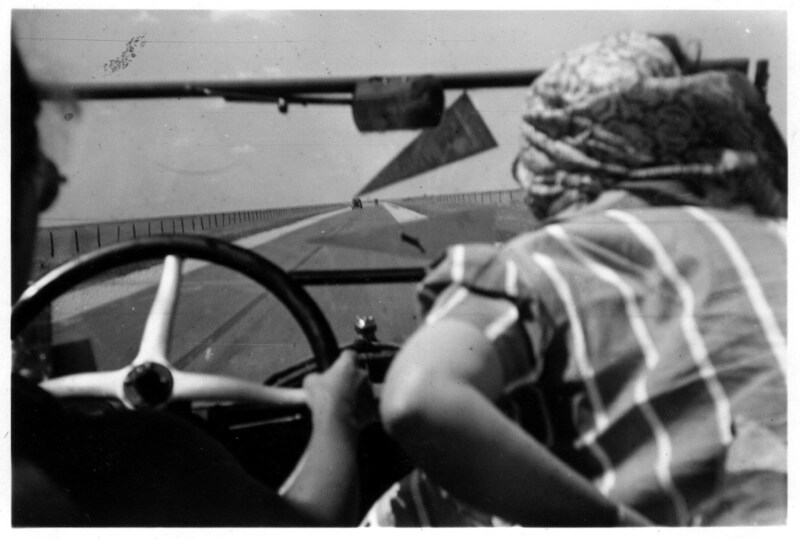 Note that the hood is off in the photo above – a trick used to help cool the engine. In Afton, Oklahoma, a gas station attendant topped off their oil for them, but about 25 miles later the car began to overheat badly. They limped into White Oak, OK, where a mechanic pronounced a burnt-out piston rod bearing due to the previous attendant leaving the oil petcock open, which had drained the crankcase. 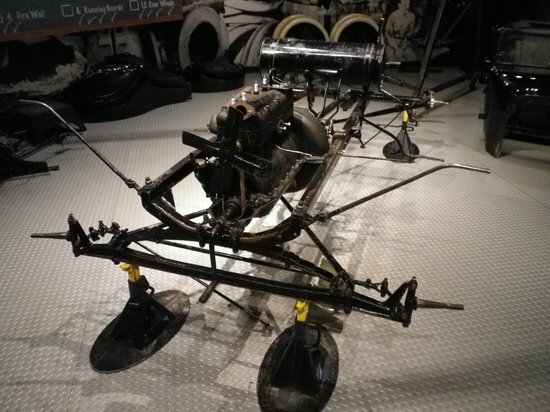 Secondhand parts were used to make repairs on the now-14-year-old car. They arrived (after many sightseeing stops and other adventures with the Silver Streak) in Los Angeles on July 19 after twelve days of travel. One of the girls who was badly sunburned had to drop out of the trip at this point, which put a bit of a financial strain on the other four girls. The girls spent some time in Hollywood and besides creating a sensation everywhere they stopped, were disgusted when people kept asking if they were trying to get into the movies! They were, however, able to get several movie and radio stars to sign the Silver Streak. Bringing their ‘star gazing’ to a close, they packed up and headed toward San Francisco. The Silver Streak’s age and accumulating mileage finally caught up with the girls at this point. First, the starter had to be repaired, which required a several-hour stop. Then, just outside Santa Barbara, the engine began misfiring – they were barely able to limp to a Ford garage, where another several-hour delay was endured as a mechanic adjusted the coils. The next morning, they had traveled no more than ten miles when a loud banging started from the engine. They made it back to a garage, where the mechanic indicated a valve head had broken and punched a two-inch hole in the top of a piston. Another half-day delay was required for repairs. They again met with loud engine noises as they drove through Paso Robles, which turned out to be a burned wrist-pin bearing. They had to wait until the following Monday for repairs. Continuing their travels, they were yet 75 miles from San Francisco when the thudding noises began to return. 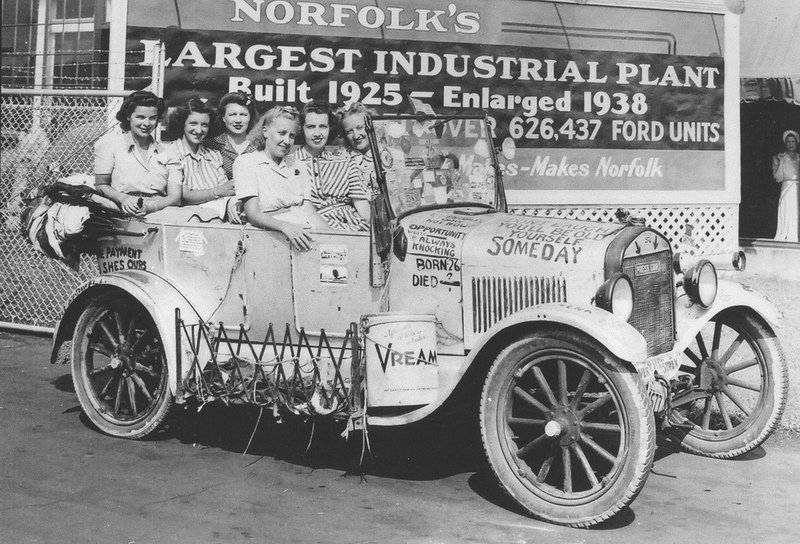 A mechanic agreed that this was all due to the oil loss from before, and the girls elected to pay $7.50 to have the car towed to Richmond to have the Ford Factory there make the repairs. The Ford people quickly took the girls into their care, while the Silver Streak went to the garage for repairs, which ultimately required replacement of the crankshaft [this is the only major engine overhaul work ever known to be done on the car – Ed.]. 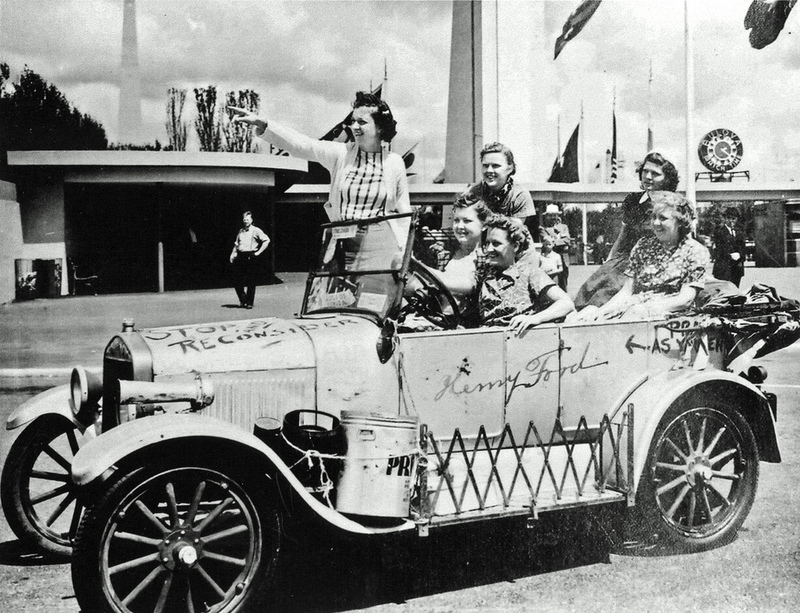 The car was then driven to the Ford Exhibit at the Exposition, where a crowd quickly gathered any time the girls were nearby. The photo above features the ‘Model T Girls,’ Clem Powell (Manager of the Ford Exhibit) and Major Keetinge (Head of the Exposition). Niggling problems continued to crop up with the Silver Streak, including a blown head gasket and a failed generator. The girls pressed on, stopping to see various sights along the way. By the time they got to Lincoln, Nebraska, one of the remaining girls had to catch the train as she needed to be home sooner than they estimated the T would arrive. Darlene and the other two girls would bump back into Bradford the evening of August 20 after a thoroughly incredible trip. The penultimate trip for the ‘Model T Girls’ would also be the last really long trip. The draft was active in the USA and all signs on the world stage seemed to point to war. Darlene was still planning on another trip in the Silver Streak, however, and wrote to Mr. Ford seeking advice on the best routes to take to the Northwest (it seems Darlene had considered driving as far as Alaska in her early planning!). No record exists of a reply from Ford, and literally as the girls were finishing loading their winter coats in the car, Darlene’s brother-in-law pointed out the aging Model T would never make it through the mountain ranges. Darlene then turned and asked if the girls would mind going South instead? 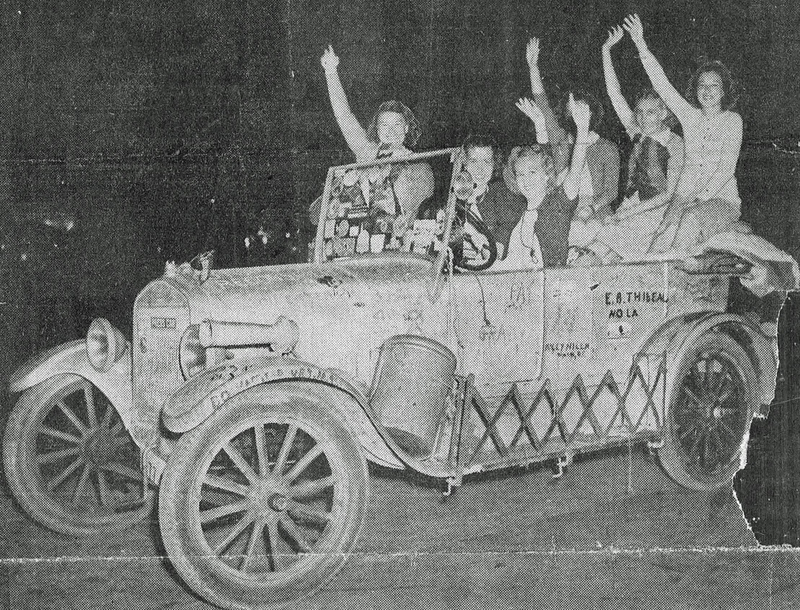 So the coats were unloaded and the ‘Model T Girls’ headed South toward Peoria and points beyond. 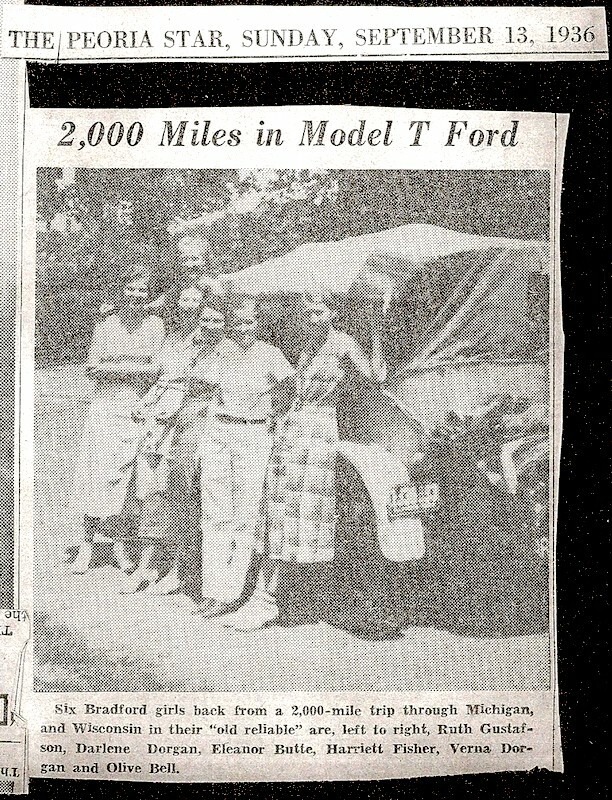 Up until this time, the girls had referred to themselves as either ‘the Bradford girls,’ or ‘the Model T girls’ in their correspondences with Mr. Ford and others. 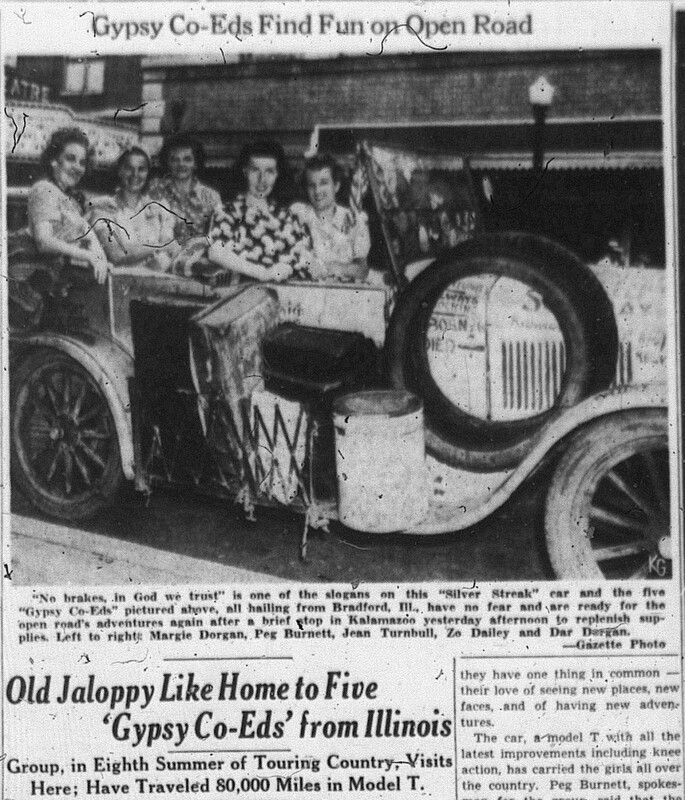 On this trip, however, they had calling cards made up with their names under the title “The Gypsy Coeds,” a name that made perfect sense, particularly when the patchwork top was put up. 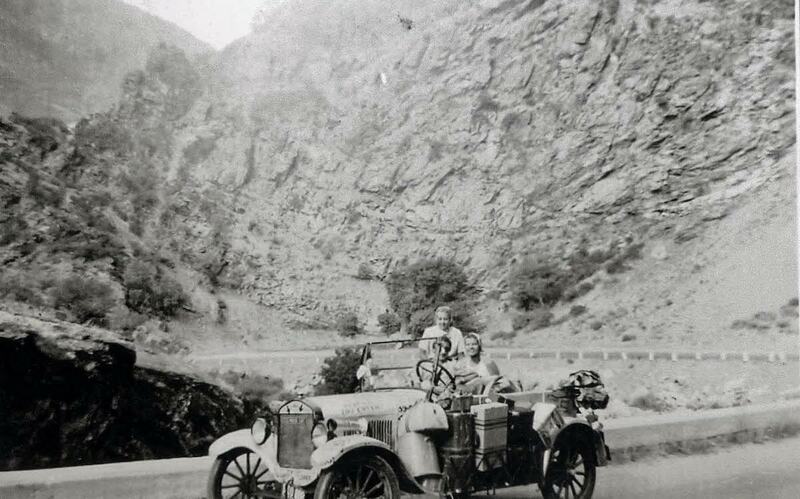 Throughout the trip, the threat of impending gasoline rationing hung over their heads (Darlene estimated the Silver Streak got around 20 miles per gallon, which was perhaps a bit ambitious). 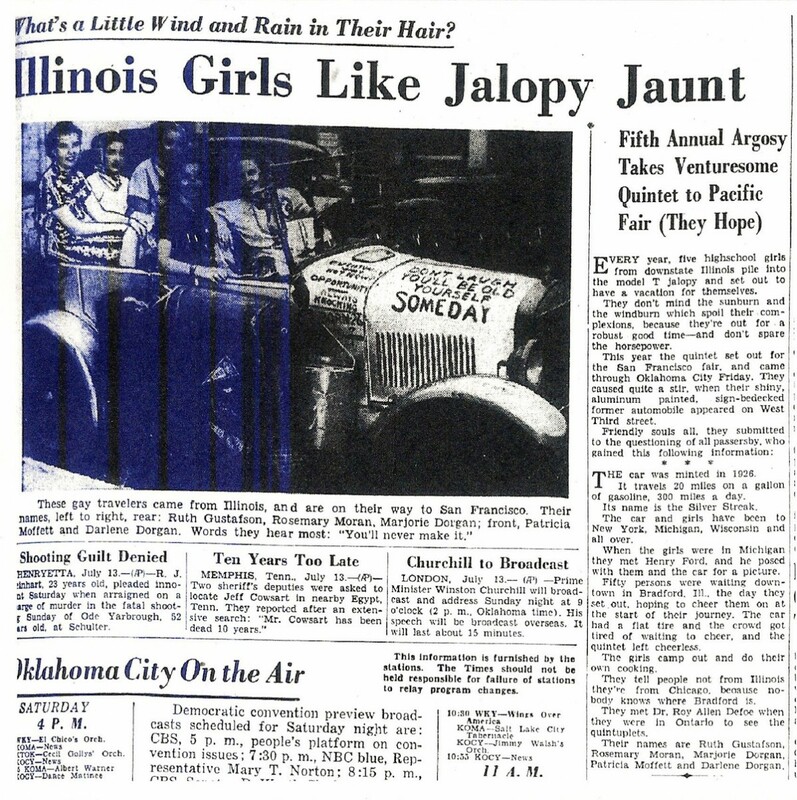 Funds were tight for the girls on this trip (partially due to some unexpected expenses), and when they noticed a newspaper ad with an offer to make ‘easy money,’ they enquired, discovering it was for the USO, who would pay them $20 to display a sign on the Silver Streak proclaiming “Shaves for the Boys” as part of a campaign to get the public to send Army boys useful gifts. 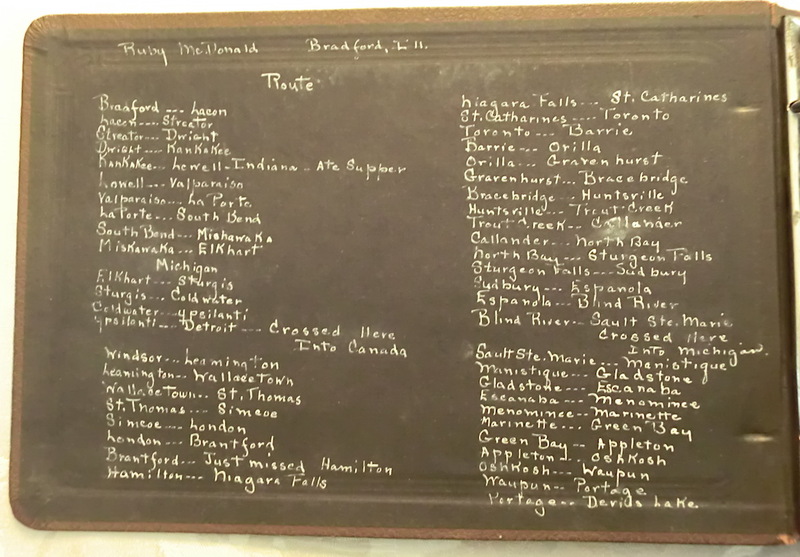 The 1941 trip would cover a number of locations throughout the Southeast (including four Army camps) and then up to Niagara Falls and back through Dearborn again, where they would finally manage to catch up with ‘Friend Mr. Ford’ one last time. Ford put the girls up in the Clinton Inn (now called the Eagle Tavern) in Greenfield Village, which was a special privilege as the structure is a museum piece and not open to the public. The T would suffer the usual flat tires, plus a broken starter spring and broken rear axle leaf spring before rumbling back into Bradford on August 28. By the summer of 1942, WWII was well underway. Doolittle had made the famous retaliatory raid on Tokyo in April and gasoline and rubber rationing were in place in the USA. People from rural farming areas moved in large numbers to the cities, where war production jobs abounded. Darlene had still had hopes of an Alaskan trip, but by April, when she again wrote to ‘Friend Ford,’ she realized that trip would simply not be possible. Darlene proposed to Mr. Ford that the Silver Streak might be used for defense bond drives. A reply from Ford’s office only stated that Mr. Ford was unavailable to offer any response. 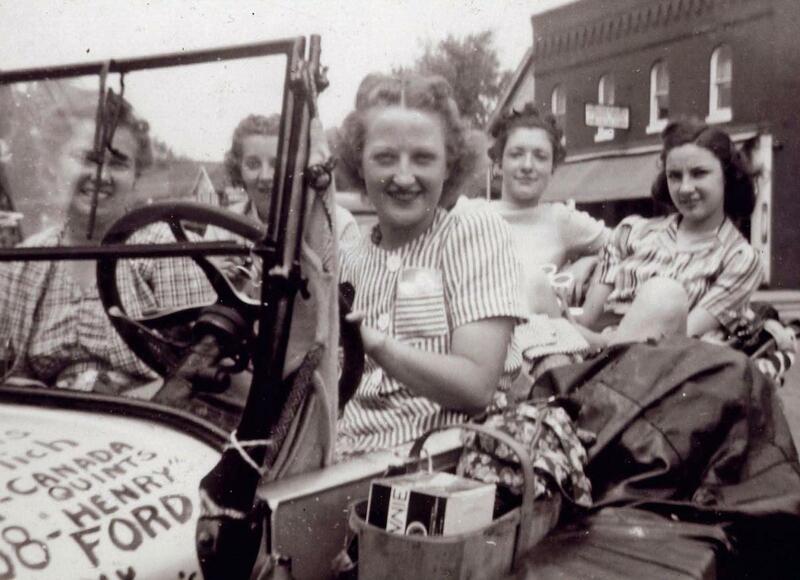 Darlene probably used the car locally during the war years, but it would soon be replaced with a more modern vehicle as she moved on to new adventures. Like an outgrown childhood toy, the Silver Streak would be stored in the back of her folk’s garage and eventually moved outside to slowly sink into the soft midwest loam. 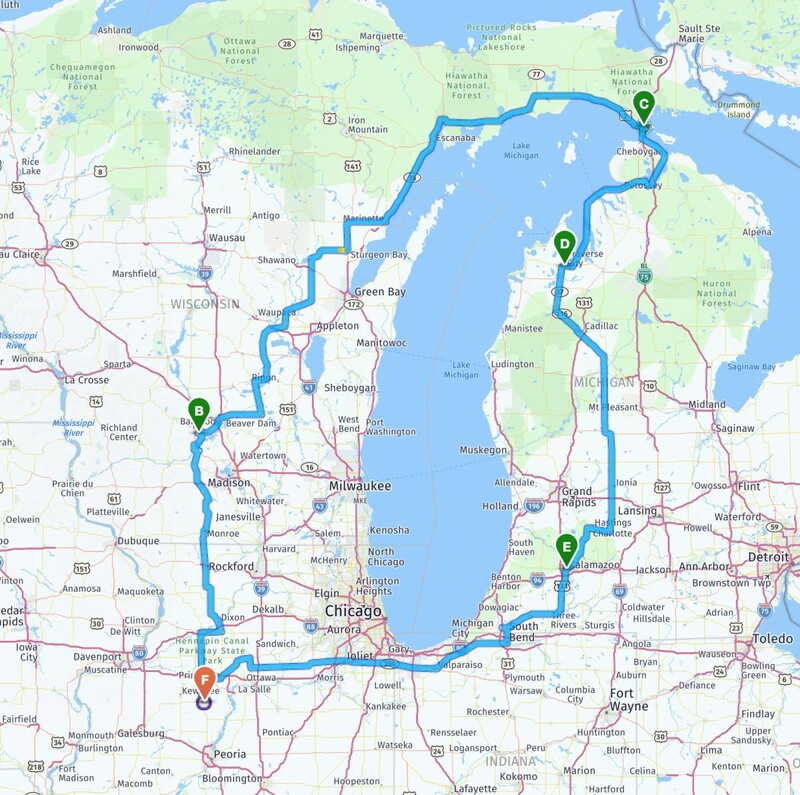 So what was your first, longest, or most memorable road trip? I’ve really been enjoying this series and looking forward to the final episode tomorrow. What most antique car lovers don’t think of is how long after it went out of production the Model T was still in general use on the roads of America. Although slightly before my time, I’m always left with the feeling that it wasn’t until the advent of the postwar automobiles (1948-49, not forgetting Studebaker in ’47) that all those T’s finally started to disappear. And disappear quickly they did. By 1949, a Model T was at least 22 years old, in a time when 50,000 miles and 7-10 years was considered the lifespan of an American automobile. Yet there were still enough of them around that they formed the basis of American hot rodding, the antique car hobby in the 50’s and 60’s were fully half Model T’s (make that three quarters Ford if you added in Model A’s), and the J.C. Whitney catalog going into the early 70’s still had a Model T parts section. It is for this reason that Ford continued to manufacture the engine for the Model T until 1941. The first aircraft designed and built by Bernard Pietenpol used a Model T engine for power. It never flew, however, being somewhat underpowered! 15,176,888 engines were manufactured in total. Thanks, Ed. This has been a great series. Darlene has had some very good fortunes on these trips. I’m liking her more all the time. Longest roadtrip? I’m not sure. We did the Hannibal to Bend, Oregon, and back in 2010; I did the Cape Girardeau area to Vancouver, BC, in 1995, coming within a few miles of Eugene, Oregon; plus the trip to The Grand Canyon in 1988. All were memorable but as for mileage, I’m not sure which was the longest. This story just keeps getting better. 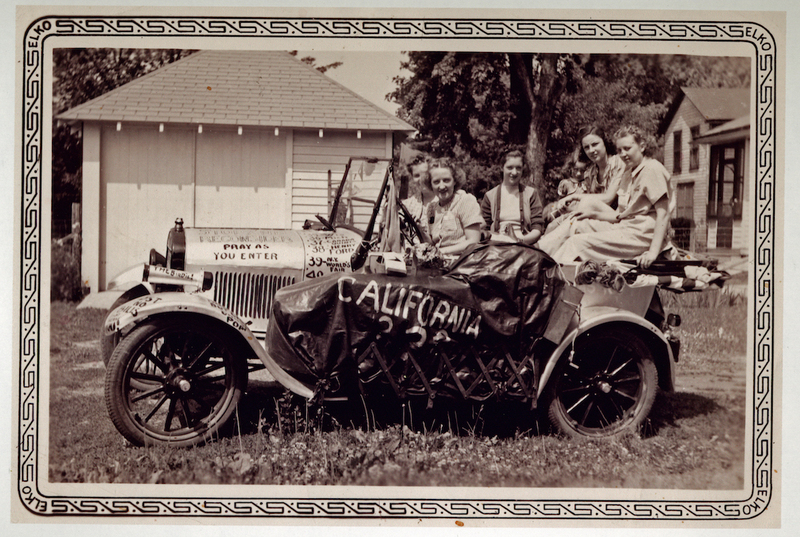 It strikes me that the really newsworthy part of these trips was not so much that it was a road trip of 5 or 6 girls, but that it was a road trip of 5 or 6 girls in a rickety old Model T. These things had a top speed of maybe 45 when brand new and cruised at more like 35. Any car from the mid 30s could easily sustain 50-55. The other thing that comes to mind is that no mechanic ever considered just replacing the engine with another. Decent Model T engines had to be everywhere in the 30s. But every one of them opened it up and fixed what was busted. Those days are long gone. 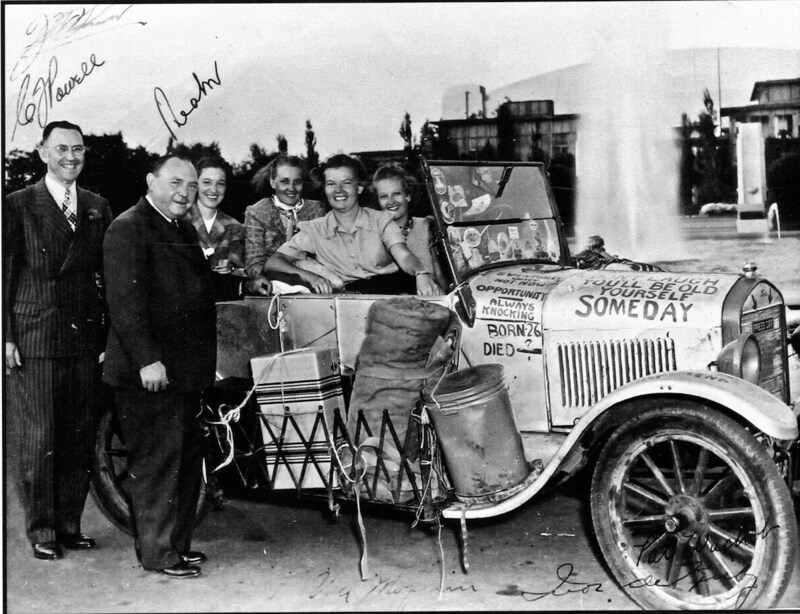 What is remarkable to me is that they somehow managed six people in that car on a long trip. Plus all their belongings! You must sit in a Model T to understand what I am talking about. Incidentally, in this day and age most parts for Model T’s are readily available. I’m enjoying these stories greatly . In the 1960’s I toured America and Canada from Rochester, New York and back again including a bit of Mexico . I also drove from Los Angeles to Guatemala City in a 1966 VW Typ III I built out of junkyard parts in 1976 . Back then none of this was anything special ~ I remember ‘T’ Model Fords being used into the early 1970’s in rural areas . What strikes me is how they had no serious problems for so long, until mechanic error damaged the engine after which it was non stop problems. No cell phones, no interstate highways and being reprimanded by police instead of arrested for vagrancy. Are we better off? In some ways yes, in others…no. My (imaginary) hat is off to these women! Talk about women traveling alone: During WW1, Oxford grad Gertrude Bell traveled the Mideast by herself, collected antiquities, became acquainted with the Arab VIPs of the area, and became so expert there, the British were forced to consult her about how to divide the area up after the War. She pretty much founded modern Hashemite Iraq, and anticipated troubles it would have, such as with the Kurds. She was said to be the only Briton the Iraqis trusted. Feminists don’t advertise her much, perhaps because she opposed the Suffrage movement (though not for the reason you might think). This should be a movie. or a book. Or a movie based on a book. The picture with Henry is unique…. he seems to be almost barely halfway slightly attempting to smile. By Ford standards that’s wild drunken hilarity. 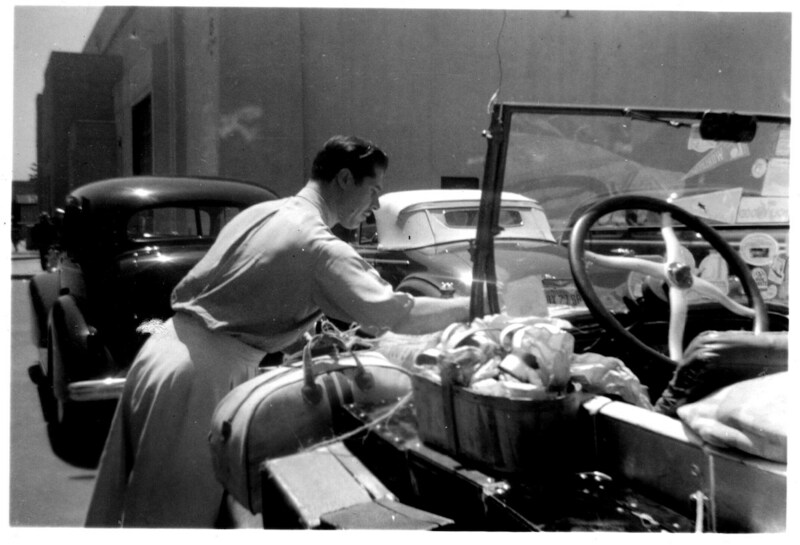 Also, there’s a peek of a ’36 Zephyr in one of the pics, emphasizing how much Ford products changed in those 10 years. I was wrong. I was at the museum today, and asked the people working the Model T build exhibit if it was age restricted, and it isn’t. Every one of our little troupe could have bolted one part on. Better yet, if I had called ahead and made a reservation, we could have assembled the entire car and taken it apart again. This is how the car starts when the museum opens each day. Museum staff do the body drop, but everything else is attached by museum guests. Looking forward to the next installment. Must be many thousands of 16 year old cars carrying 5 girls on road trips that no one would ever give a second thought to today. Model T was a hell of a durable car for it’s time and as this article shows for many years after. The ’30’s cars advanced quickly out of the “horseless carriage” of the ’20’s. 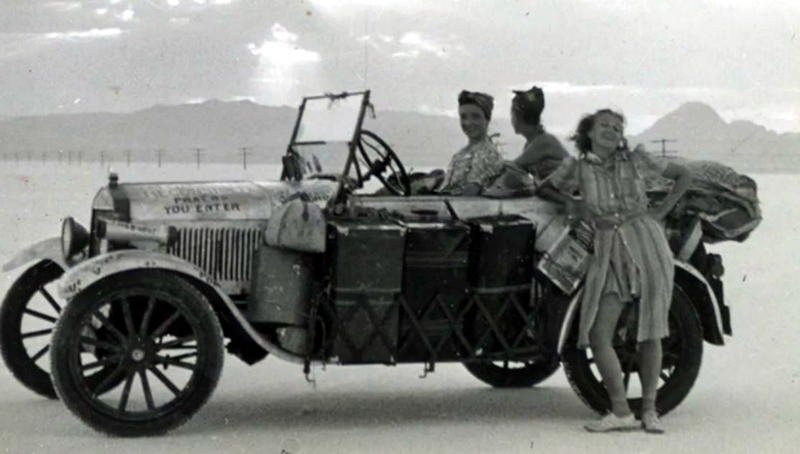 If they did the same trip in a Model A, I wonder how much attention these adventures would have gotten from the press? Which car would have held up better? What great tale, waiting for part 3. Must have been a tough bunch of ladies. I think it was nice of Henry Ford to meet with them and have them kind of looked after on later trips. I think he must have liked the spirit these girls were showing and driving his most loved car the Model T, not to mention the PR angle. These girls are better than Roller Derby. I can’t wait for tomorrows story. This story has a sense of “A League Of Their Own” about it. I too am waiting for the next episode but am already guessing each player thrived amid the opportunities of the post war period. At least that’s my hope. My first real road trip started from Sydney and looped right through central and western NSW. This mid 80s adventure was undertaken in the Phoenix and we spent more on petrol than the accommodation over the week it took. The most memorable part would be after the supply hose for the power steering split neatly jetting fluid onto the RH exhaust manifold. Smokescreen! It was a certifiably old car at the time and finding Mopar spares was never easy. I removed the belt from the pump, revised the itinerary, and drove it back never getting used to just how much play there is in an unpressurised steering box. Guessing how to set it up going into sweeping bends on undivided roads with oncoming trucks was interesting. Indelible memories like this have me paying the auto club for top benefits including hire cars and tilt trays these days. This is an excellent read. For those of you interested in how technology changed the lives of women in the late nineteenth and early twentieth century, “Cheap Amusements” by Kathy Piess could work as a supplement to Ed’s writing. My first long road trip without my parents was in January 1967 during semester break in college. My buddy and I wanted to go to Florida, but didn’t have enough money, so my Dad suggested that we visit my aunt in a Detroit suburb and go see the sights. That’s what we did in my 1962 Fairlane with the 170 six. Ironic to this thread, we went to the Ford Museum also. One day we went across the bridge into Windsor and later toured the Rouge . It was a fun, although cold trip, and as a small town guy, my first experience driving on the Interstates. I had already driven some in Detroit on a previous family vacation. 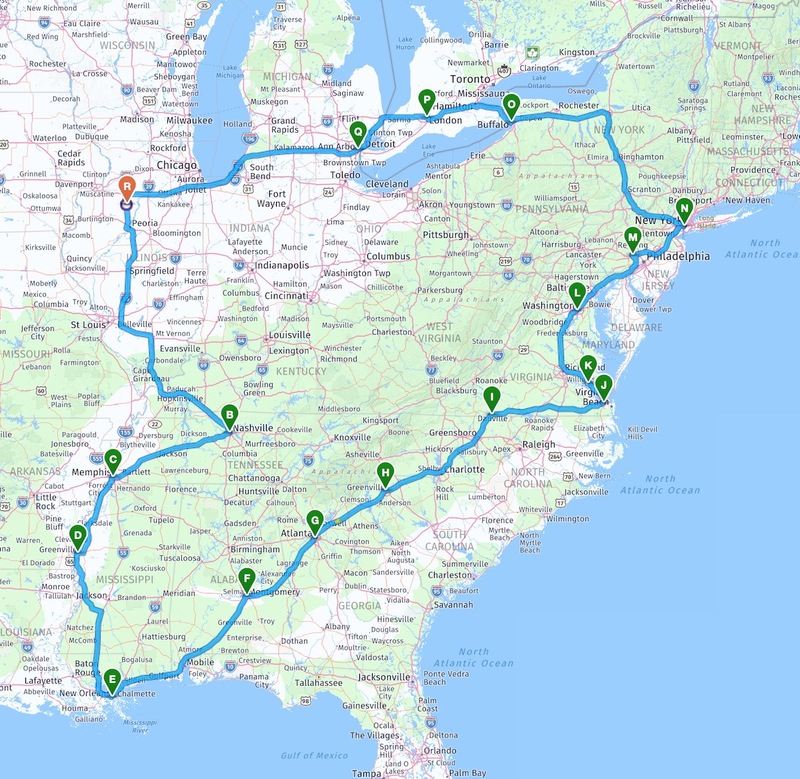 My longest road trip was in 1996 when my wife and I made a quick trip from southern Indiana to Los Angeles and back to pick up our daughter who was going through a marriage split up. We made it out and back in 6 days in a short bed,regular cab 1995 Ranger pickup. It got a little crowded on the way back with 3 in the cab and a gearshift sticking out of the floor. The truck bed was loaded and we were pulling a U-Haul trailer. There were a couple of mountains that I was not sure the V6 could make it up. This trip included two 19 hour driving days on the way out. On the way back we did take a little time to get off the Interstate and drive some of Route 66. I have always been a guy who loves driving. Before we went my wife asked me if I was OK with going out to get our daughter. My reply was that I had always wanted to drive to the west coast. I drove all of this trip except for maybe 45 minutes. I always tell people that if you put a steering wheel in my hands I’m a happy guy! I was fortunate that I had a career in which I drove at least 200 miles each day in different directions. I notice the car has Pismo Beach, CA written on it, indicating a visit there I guess. That’s over on the central California coast, but your map has them heading right up the center of the state on HWY 99. Did they actually go to Pismo? The maps are only a “best guess” using google maps, and I didn’t put every single stop listed in the book in when I created them (and keep in mind some of those roads didn’t exist in the late 1930s)… so yes, it’s almost certain they stopped at Pismo. Hi Heath. Yes, they did stop in Pismo Beach, page 156 in the book. They had repair work done on the car in Santa Maria the day before, and got to around Pismo Beach when “we heard peculiar sounds in the engine and loud banging started.” While the car was in a shop in Pismo Beach, they bought steaks and buns and fried steaks on the beach. I drove about 5,000 miles in 3 weeks from West Danby to Ventura in an 18 year old Plymouth Voyager which was my longest road trip.